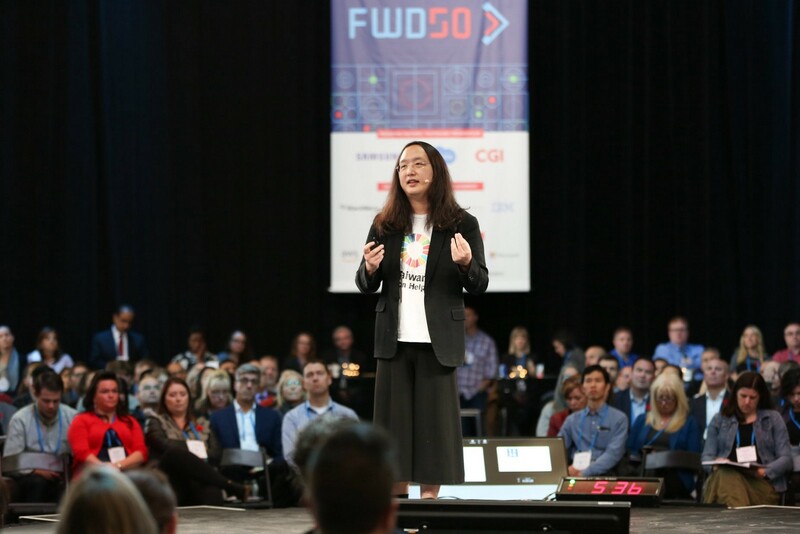 At FWD50 this year, we launched an entirely new conference format. It took a ton of work by a big team, from iterations and experiments to testing out technology and building infrastructure. It went really well—and we want to share what we learned, so you can run one too. Two hours of accessible, unscripted engagement between hundreds of people makes all the planning worth it. This is a long post. And while I’m writing it in the first person, I put it together with my partner Phil Telio and the rest of the Embrase organization—Rebecca, Pam, Katherine, Alix, and others—plus the team at BLVD. In writing this, we erred on the side of completeness so we’d capture all the things we learned. I ran my first conference in university, where I handled marketing for the 1992 Dalhousie Business Seminar. And since that time, I’ve been collecting and trying out interesting, unexpected formats for conferences. My love of building platforms for interaction and setting people loose within them to see what happens really dates back to coding and running a Bulletin Board Service (BBS) on my Apple ][ in my teens. I loved changing how the system worked and seeing what it did to users’ behavior. Conferences are really just another version of that. The format and the content are inseparable, and done well, complement each other perfectly. Most conference-style events consist of either single-speaker talk, or panels of experts hosted by a moderator. And while these time-worn approaches have their place — well-moderated panels can be superb — those formats need updating. For one thing, the audience can now tune out pretty easily from their seats in ways they couldn’t a decade ago— checking their phones while they wait for the next speaker, which is no longer frowned upon. For another, panels can often devolve into “agreeing contests” where participants double-down on the initial remark, or speak just so they feel they got a word in. An Oxford Debate, which is a two-versus-two debate format inspired by the Intelligence Squared podcast. I wrote about one of the first such debates, held at Strata, which provides a bit more detail. The most successful one to date was at Cloud Connect, where we argued the proposition that “Clouds are secure.” We ran one at Scaletech this fall, and it was a blast. A Chain Reaction panel, in which a sequence of pairs of panelists act as interviewee, then interviewer. I also wrote this up, and you can see one we ran on street-smart entrepreneurship at Startupfest 2012. What’s cool about this format is that it’s a sort of broken telephone: You never know where it will lead. At Startupfest, the discussion morphed into whether you need to come from a broken home to be a good hustler. Our most recent one had Georgian Partners, interviewing AirBnB, interviewing Twitter, interviewing Uber — a fantastic combination of ideas and iconic companies. The Short Bit model, where every attendee who comes has to present. This has mostly been done at Bitnorth, an invite-only retreat I’ve run for a few years, where the topic can be whatever the speaker wants. But it could be narrowed to a specific topic — digital government, artificial intelligence, etc. There are many other formats out there: Lightning talks; Reverse panels; Liveblog co-authoring; Hackathons and Make events; and Backchannel Panels using questions from a social network or app. All work in different sizes and venues. The challenge with Unconferences is that they’re almost completely unstructured. They work well for a bunch of Alpha Geeks in an orchard — folks who are accustomed to being the smartest person in the room—but in other groups, the lack of structure can be a liability. In 2009, I was running the cloud computing track at Interop, as well as the Enterprise Cloud Summit. The event’s organizers, United Business Media, asked me to put together an unconference format of some kind. 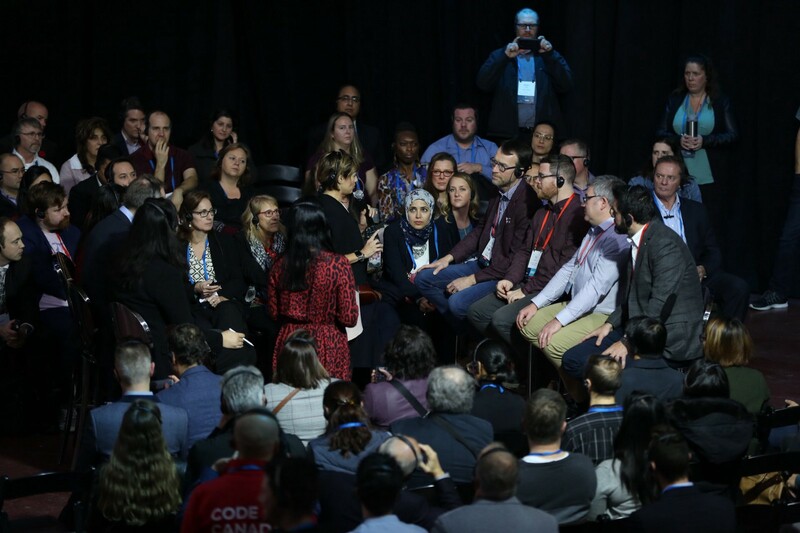 Knowing that these attendees needed a bit more guidance, I organized a series of “speed dating” talks between specific technologies and business problems. It happened in a huge room, and it went much better than expected. A couple of years later, we tried it again at Cloud Connect, the conference that spun out of the Enterprise Cloud, running another one (which Shlomo Swidler, one of the moderators, wrote up.) We called this a Birds of a Feather format. For the last eight years, Phil Telio and I have worked on conferences together, most notably Startupfest, a large, not-for-profit startup event in Montreal each summer. 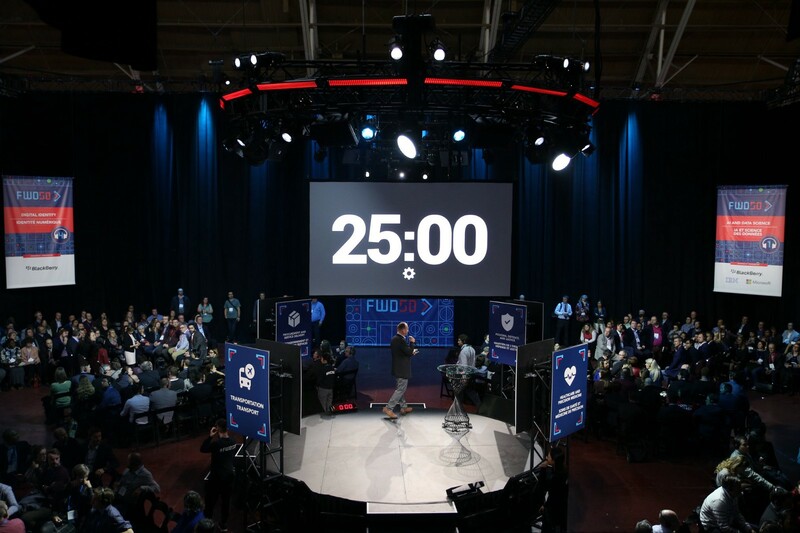 Last year, we launched FWD50, a conference on digital government in Ottawa. The event went really well, but one of the key takeaways was that the attendees wanted a chance to interact with one another and visiting speakers. We didn’t know the topics for the corners or the center of the event. We didn’t know how to explain it clearly. We didn’t know how to lay out the room and facilities for the event to make it clear how things worked. We didn’t know how noisy it would be, or how to handle that. 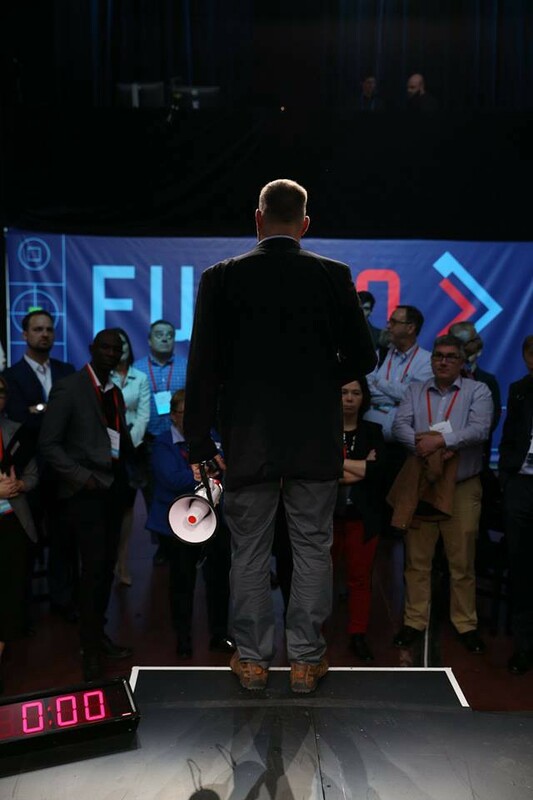 FWD50 aims to be open and inclusive, and we didn’t know how to ensure that it was accessible for everyone. We didn’t know what training the moderators would need. Those six questions occupied much of our lives for the past few months. We had some basic ideas of what technologies we wanted to look at; and we knew that certain tech-friendly departments of government were willing to get involved. So we ran a survey to see which technologies and departments our community cared about. In the end, we settled on four technologies (AI and data science; blockchain; identity; and sensors and the Internet of Things.) We also settled on four domains of government: Transportation; healthcare; defense and border security; and procurement and service delivery. 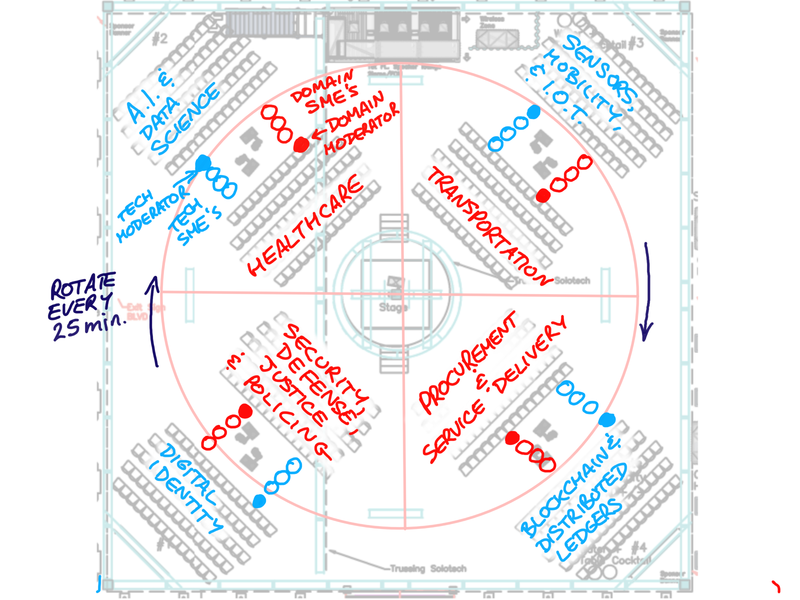 One of our sketches overlaying topics and technologies atop the rendered floorplan. Note that if we’d had “AI” as one technology and “data science” as another, we’d have had too much repetition — many of the challenges of AI and machine learning come from the data with which we train such algorithms. So those would have been too close to one another. With the topics chosen, we set out to find 2–4 Subject Matter Experts (SMEs) for each technology and domain; and a moderator for each one. We needed SMEs to get things started with the conversation, and moderators to ensure that things flowed smoothly, and that nobody monopolized the discussions or started pitching their products. Circlesquare is incredibly obvious once you’re in it. But explaining it to people — particularly corporate organizations accustomed to delivering a talk that has been approved by a marketing department — proved really challenging. And ironically, the more we explained it, the more people felt it was complex. We had calls to brief the moderators. We also had a “dry run” with 20 friends in a loft, picking topics and watching it unfold to learn from the process. Ultimately, what worked best was having moderators and SMEs gather in the venue an hour beforehand, and walking them through it step by step. Once they saw it in situ, everything seemed straightforward. As we realized that explaining the format was hard, we concluded that the layout of the room had to speak for itself. This meant that everything — seating, signage, even the shape of the room itself — should reinforce the model. In fact, we really doubled down on the format: We switched from a traditional stage in which the audience and the speakers are facing one another, to an “in the round” stage for keynotes, which made the conference feel much more like a gathering, and helped with intimacy between speaker and crowd. Here’s the extraordinary Audrey Tang, Digital Minister in Taiwan, speaking in the round at the event. To begin, we decided to erect huge banners in the four corners of the room, indicating the technologies. So it was clear where an AI or a Blockchain SME would sit. But what about the topics that rotate around the room over the two hours? One of our early questions was how to make people move when the 30 minutes of discussion was up. We looked into a lazy susan that would move everyone — but quickly abandoned that idea because of safety concerns. We even thought about rotating four dividers made of ropes and foam “pool noodles” to shepherd people around, but decided this wouldn’t be fun for participants. The domain signs, on wheels, waiting backstage to be deployed. 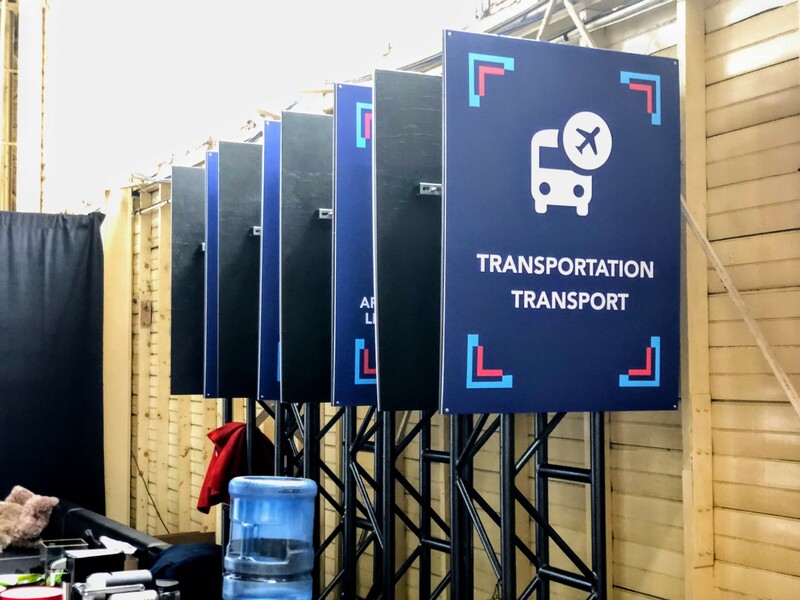 Ultimately, we settled on mounted signs with each domain on wheeled trusses, letting us push them around the room over the course of the two hours. Partly this was due to the realization that while the moderators and SMEs had to move, the audience could go where it wanted. So we didn’t want to force people to move. We also needed a signal that it was time to move, so we displayed a countdown timer on the central screens. At three minutes before the end of each rotation we sounded a chime; and when it was time to rotate, a gong. Finally, we put two sets of chairs facing one another in each corner, and stools for the SMEs to sit in the middle of it all. When I’d run the unconference event in 2009, it was in a gigantic room with a bar in the middle. And it was noisy. Each corner had an easel, a projector, and 50 seats. People could shout in the corners, and move from area to area. In a smaller space, with more people, we knew something had to change. Phil was worried about this from the outset, and came up with the brilliant idea of using microphones and headsets, with a channel for each corner. It’s hard to emphasize just how much this changed the format for the better. Everyone could hear, so nobody was shouting. The microphones controlled interruptions — like the conch in Lord of the Flies, they dictated who was speaking. Side-channel conversations weren’t disruptive; people just took off their headsets. The audience could sample each corner, and decide to move if they found some other topic interesting. To make this work, we coordinated eight microphones and four audio channels, and put the number of each channel on the large corner signage so people knew where to tune in. Hundreds and hundreds of participants tuning in to four concurrent conversations. One benefit of the configuration was that it made the event accessible to many more people. Some folks who didn’t want to be in the crush of interaction could sit on the sidelines and observe; people who had difficulty hearing could put on headsets without having to get close. We ensured that there was space for wheelchairs at the edges of each corner, and room to follow the rotation around. We learned of some ways we could do even better (see below), particularly by employing transcription technology to allow even more people to understand what was being said. The moderators were key to the success of the event. They had to be relatively knowledgable about the technology or domain — so they could identify when things had gone too far afield, or when someone was pitching a particular product. 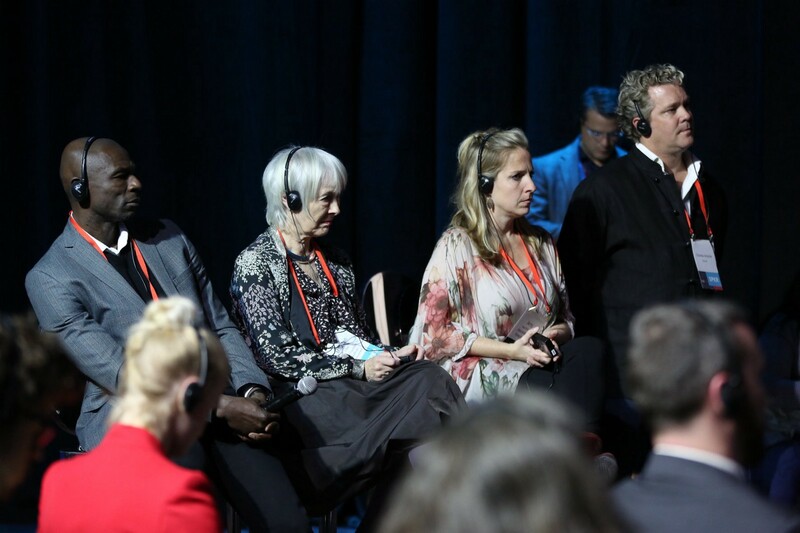 Each moderator had a microphone, so at any given time, one person was speaking, and one microphone was traveling from the previous speaker to the next one. 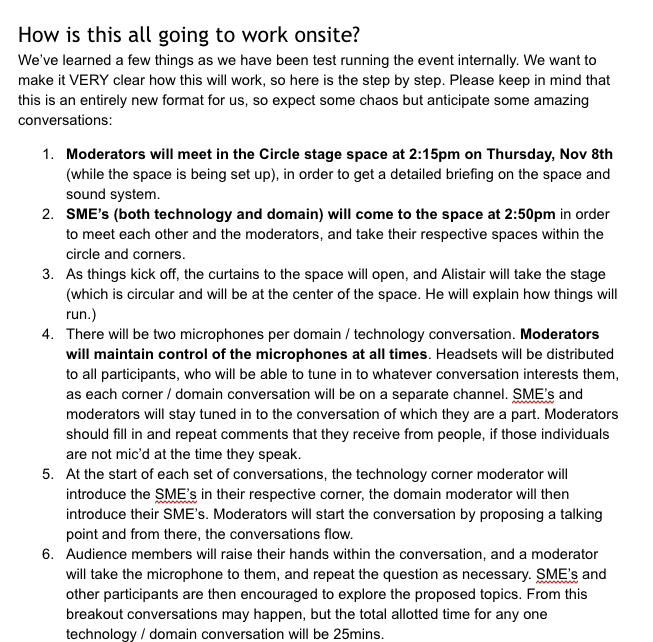 Part of the detailed notes we created for moderators in the weeks leading up to the event. The moderators also had to be diplomatic and tactful. 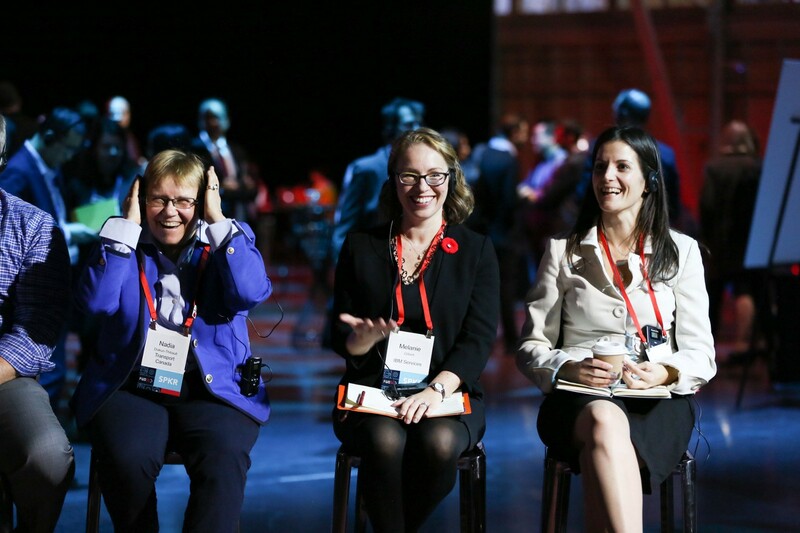 They were trying to manage discussions among some of the most influential and active people in digital government around the world — many of whom had been keynote speakers at the event, or had traveled halfway around the globe to attend. Taking a microphone away from them would be challenging at the best of times. A final briefing with the moderators before we pull back the curtains. Introduce your SMEs at the start of every rotation. Be sure to call on men and women equally, and look out for those with questions who might not be the loudest voices in the room. Don’t just let the SMEs talk. Encourage the audience to ask questions, but also to answer them or challenge responses. Politely cut people off after 1–2 minutes to ensure many people get a chance to speak. It took a while to get the room ready—in fact, we blocked off the session in the room beforehand, so we could set everything up and change the corner signs with channel numbers. Using scissorlifts to replace signage mid-conference. Once we opened the curtains and let people in, I explained the format over a microphone from the center of the stage. Getting people ready for the first discussion. Ask brief questions that can be answered, if you’re asking a question. It’s participant-driven, so everyone can participate. As with all unconferences, vote with your feet. If you want to take a conversation outside, that’s fine. If you want to join a different group, do so. Then we asked the pair of moderators in each corner to speak into their microphones, and for the people in that corner to raise their hands if they could hear things. This allowed us to quickly verify the correct configuration of the microphones and to get the audience to adjust their headsets to the correct channel. And then we started the countdown, and the room went silent. Some of the Subject Matter Experts trying out the headphones for the first time. This was the biggest, most unexpected consequence of headsets: We expected a din. Instead, we could hear the roof creaking. It was eerie. But of course this is what happens when nobody needs to shout. In fact, absent occasional bursts of laughter from a corner — which quickly prompted some of the audience to tune into that corner and see what was so funny — it remained relatively silent for most of the two hours. The first rotation was a bit chaotic. People hadn’t been looking at the clock, and didn’t stop speaking immediately. But after the first rotation, everyone understood how to wrap up their discussions before rotating. Light sensitivity: When it was time to rotate, we cued some lights to remind people it was time. But a couple of participants asked us, via Twitter, to stop the blinking lights due to light sensitivity, so we eliminated that after the first rotation. Having realtime feedback from participants was incredibly useful, given that this was an experiment for everyone involved. Live transcription: We could have translated the audio of each conversation in realtime into French, or have displayed the words that were being said on a screen in each corner to make things even more accessible to a wider audience. Show them a menu: While the audience was waiting outside for curtains to open, we could have shown them the four technologies and four domains, and asked them to identify which they wanted to join. This would have saved us a couple of minutes while attendees oriented themselves to the room and format — like making customers in a restaurant look at the menu while waiting in line in order to speed up ordering. It’s hard to be a moderator when you’re smart. We had moderators who could easily have been SMEs, and we had to ask them to bite their tongue. Sometimes that was difficult for them, and I felt terrible reminding them that for the duration of the event their job was to get others talking, rather than to chime in themselves. Doubling down was good. The format wouldn’t have worked if we hadn’t committed to it completely. From designing the stage around it, to renting hundreds of headsets, to insisting that world-renowned speakers took part, to not scheduling anything else at the event during that time, to publishing about it beforehand, to shout-outs from the stage in the talks leading up to it, we ensured that the focus was almost maniacally on Circlesquare. That mattered a lot, because attendees thronged the session. Seating changes behavior: At the outset, the SMEs and moderators were close together on two facing rows of stools. I realized that many of the people in the audience could only see their backs, so I asked the moderators to move the chairs apart after the first rotation. I noticed that when SMEs’ stools were closer together, it felt more like a “panel discussion,” with the audience sitting on the sidelines and the famous people in the middle. When they were farther apart, it felt more like a “town hall meeting” where everyone could chime in. This varied considerably based on who the moderator was — and neither format was better or worse — but it was fascinating to see how a shift in seating could alter audience participation. Don’t move the microphones: While the moderators, SMEs, and many attendees moved around the room, the pair of microphones in the corners needed to stay put. We could have color-coded them to make this more obvious; instead, we had volunteers and stage hands pushing the topic signage around the circle, and ensuring that the moderators didn’t accidentally take the microphones with them. Repeated introductions waste time: The first 3–4 minutes of each rotation involved the moderators introducing the SMEs. Half of the audience had already heard this each time, so we could have saved time by introducing them all, once, before kicking things off. Record the soundboard: With 16 converations over 2 hours, and the use of a pair of microphones limiting interruption or concurrent speaking, it would be a simple matter to record, transcribe, and publish the discussions after the fact. One government department told me at the event that they plan to use this format for public consultations for just that reason. FWD50 is constantly urging governments to innovate, to take risks, and to recognize that perfect is the enemy of good enough. And with Circlesquare, we were putting our money where our mouth was. It wasn’t perfect, but it was definitely unexpected. And following our own advice, we used the first one as a chance to figure out what worked—and share that with the world. Within a few minutes of the end of the event, I had three attendees—who run three different conferences—declare that they were going to use this format in their own events. We thought it would be fun and engaging . We took a big risk running it (and so did the sponsors who supported the idea.) We had no idea just how transformative it would be, or how unequivocally positive the feedback would be. The world needs novel models for engagement, and through determination, testing, iteration, and dogged persistence, Circlesquare turned out to be just that. We’re incredibly grateful to the moderators, A/V teams, SMEs, and even those who turned out to experiment ahead of time and get the bugs out in developing the format, which is why we’re going to such great lengths to document and open source the model. We hope you’ll run one of your own, tag it #circlesquare, and let us know what you discussed and what you learned. And in return, we’ll keep testing and sharing new ways to transform events and encourage real, accessible interactions. This format really lends itself to social media. Here’s a sample.